Be on the lookout for snow. It has been a rarity this winter across the Midwest. Here's an interesting statistic. As of today, Midland, Texas has had more snow than Chicago, the Twin Cities, Boston or New York City. So where is all the snow? I can tell you where it isn't. It isn't over the United States (lower 48 states). 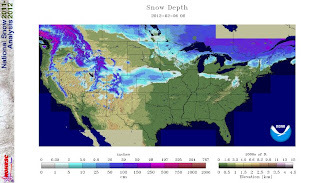 Below is a map from NOAA indicating snow depth as of this morning. Notice the lack of snow, even over the northern plains. As of this morning only 26.2% of the United States is covered by snow. This is the lowest amount of snow coverage for this day since 2005.